UCubed is calling on Republican governors and state legislatures to cease their attacks on the unemployed and focus on creating the jobs their states and citizens so desperately need. 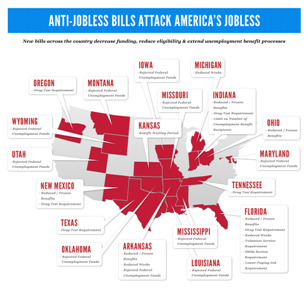 As part of the latest installment of UCubed’s ad campaign on Facebook, meant to bring attention to the current jobs crisis, UCubed has put together a map outlining which states are currently pushing legislation aimed at punishing the unemployed – rather than putting their out-of-work citizens back to work. See UCubed’s ad campaign on Facebook.